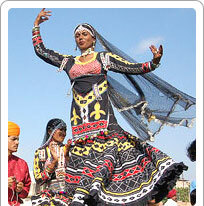 Marwar festival is by far the most popular festivals in Jodhpur. It is held in the Hindu month of Aswin that falls in September October each year. Earlier known as the Maand Festival, this is a two day festival held on Sharad Poornima. The purpose of the festival is to commemorate the valiant heroes of Rajasthan and simultaneously it also displays the music and dance of the Marwar region. The art and culture of Jodhpur is showcased at Umaid Bhawan Palace, Mandore and Mehrangarh Fort that are symbols of Jodhpur pride. Camel tattoo show and polo are the attractions in the cultural extravaganza, an integral part of the festival.